For thousands, even millions of years, little pieces of our earth have been eroded--broken down and worn away by wind and water. These little bits of our earth are washed downstream where they settle to the bottom of the rivers, lakes, and oceans. 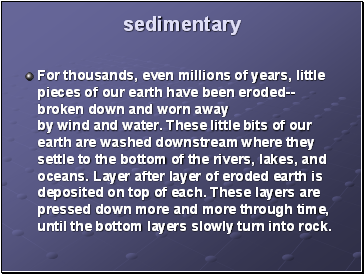 Layer after layer of eroded earth is deposited on top of each. These layers are pressed down more and more through time, until the bottom layers slowly turn into rock. 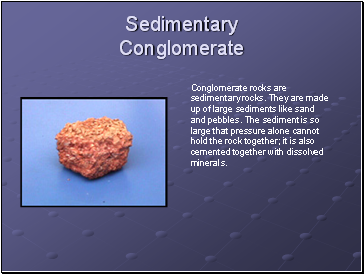 Conglomerate rocks are sedimentary rocks. 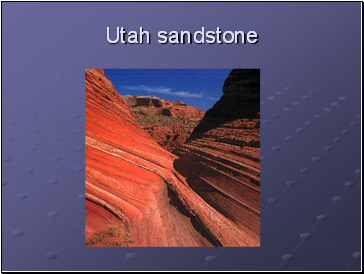 They are made up of large sediments like sand and pebbles. 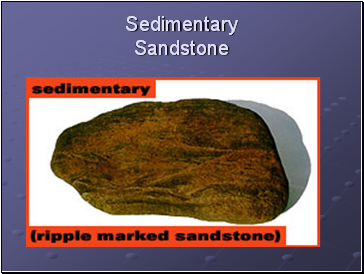 The sediment is so large that pressure alone cannot hold the rock together; it is also cemented together with dissolved minerals. 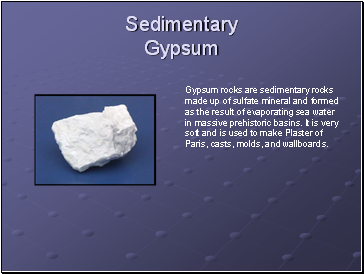 Gypsum rocks are sedimentary rocks made up of sulfate mineral and formed as the result of evaporating sea water in massive prehistoric basins. It is very soft and is used to make Plaster of Paris, casts, molds, and wallboards. 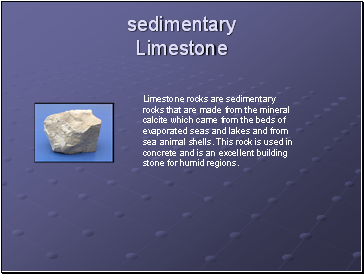 Limestone rocks are sedimentary rocks that are made from the mineral calcite which came from the beds of evaporated seas and lakes and from sea animal shells. 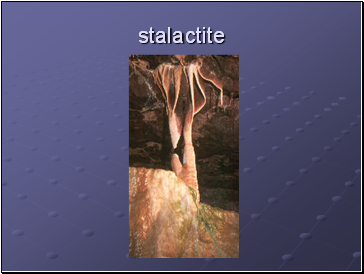 This rock is used in concrete and is an excellent building stone for humid regions. 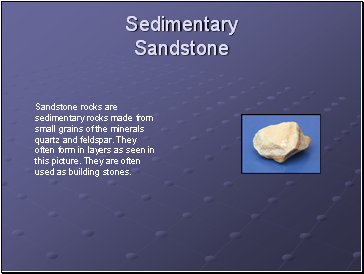 Sandstone rocks are sedimentary rocks made from small grains of the minerals quartz and feldspar. They often form in layers as seen in this picture. They are often used as building stones. 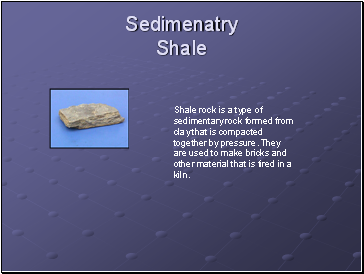 Shale rock is a type of sedimentary rock formed from clay that is compacted together by pressure. They are used to make bricks and other material that is fired in a kiln. 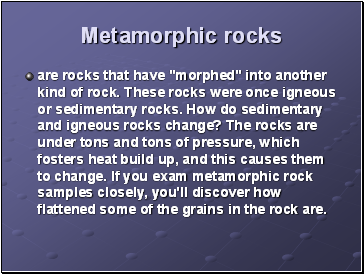 are rocks that have "morphed" into another kind of rock. These rocks were once igneous or sedimentary rocks. 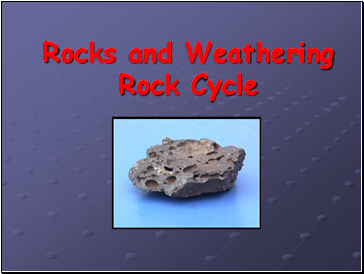 How do sedimentary and igneous rocks change? The rocks are under tons and tons of pressure, which fosters heat build up, and this causes them to change. If you exam metamorphic rock samples closely, you'll discover how flattened some of the grains in the rock are.